Overview: The giant puffball typically grows in width and height anywhere between 10 and 70 cm (about 4” to 27”) and can weigh several kilograms. It has and continues to be been a great source of food for many people worldwide. Historically, it was used by the Iroquois and Meskwaki for food. In addition to being a source of food for centuries, the giant puffball was valuable as a styptic dressing to stem the bleeding of wounds. The giant puffball can be found growing as a solitary entity, in small groups, and they have been known to form large circles. Distinguishing Features: Calvatia gigantea are easy to spot, although from a distance they could be mistaken for a volleyball. 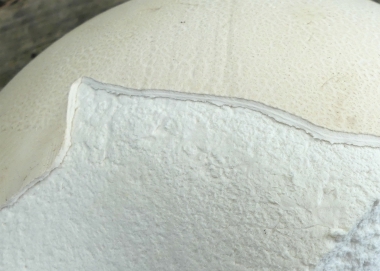 Young giant puffballs have a white, fleshy interior. 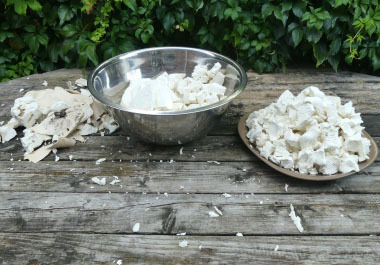 The flesh of a puffball is called the gleba, and when immature (and edible), it is pure white and has the texture of marshmallow. Once mature the gleba’s colour changes to yellow and brown and it should not be eaten at this stage because of its poor taste and possible toxicity. They develop trillions of spores at this stage of its life and the exterior will eventually crack to release these spores. This process is usually expedited by weather conditions, wildlife and of course, us. 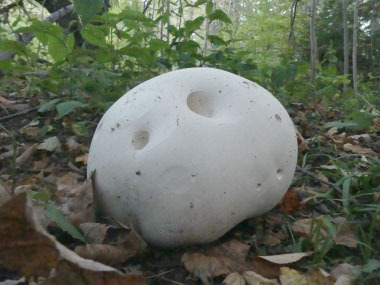 Height: The giant puffball can grow anywhere between 10 and 70 cm (about 4” to 27”). Habitat: This puffball is often found at the edges of fields, and in rank vegetation in nutrient-rich waste ground and on woodland edges. 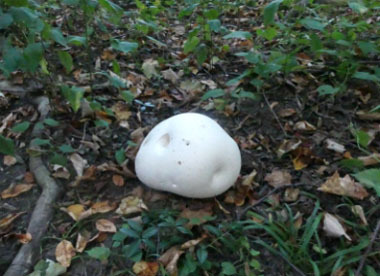 Although not common, the giant puffball is found in open woodlands. 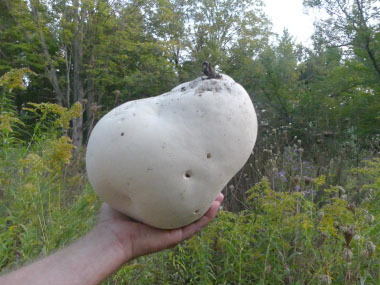 Giant puffballs grow in many locations throughout Canada, the US, Europe and Asia. Spore print: Olive brown. According to a student researcher at Cornell University, it was calculated that a single 25cm (10”) giant puffball has 7 trillion spores. 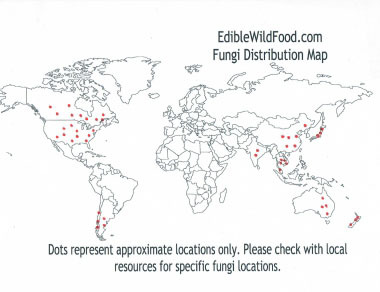 If each of those spores grew and yielded a 25cm (10”) puffball, the combined puffball mass would be 800 times that of the earth. Season: Late summer into mid autumn depending on location. Edibility: Always cook before eating or dehydrate. The taste is rather faint, yet there is a pleasant scent. Some simple rules must be followed before eating a giant puffball or any puffballs. The interior tissue must be uniformly white. If infested with insects/maggots it should be trimmed in order to avoid the infested parts. The outside skin is easily peeled and should not be eaten if it is tough, leathery, or dirty. 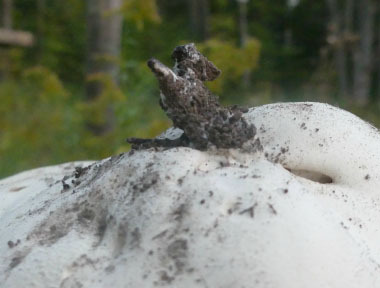 Never wash the puffball with water as it will soak up water like a sponge and become very soggy. 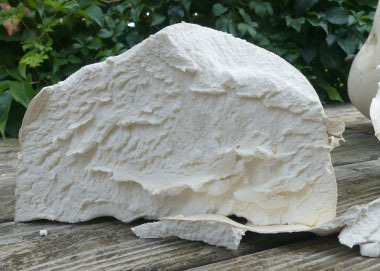 This and other edible puffballs can be stored for up to 5 days in the refrigerator without losing significant quality.